Hey guys, I don’t know if you don’t know, but most anime are some form of advertisement. 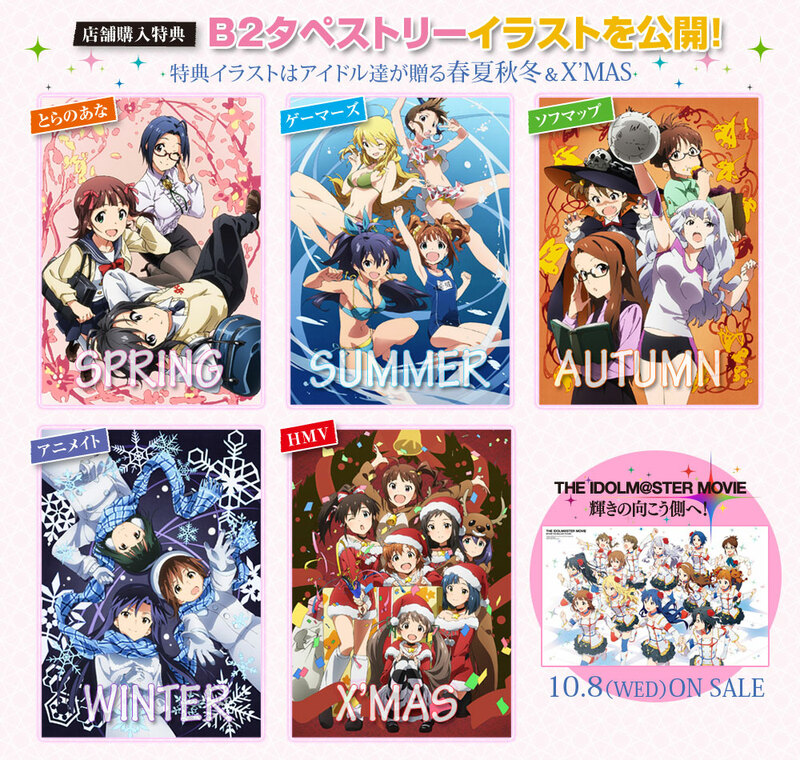 So why are you complaining about that Mlilion Live is being advertised in the Idolm@ster Movie (Moviem@s henceforth)? As someone who has been enabled by Moviem@s (and many other things) and started playing Million Live after my trip to Japan this past February, I enjoy my Scamco-driven animated promotional material. Speaking as both a customer and a victim in this sense, the fact that they have to charge money in order to let us watch this stuff is probably way, way, waaaaaaay more obnoxious of an arrangement in this process than the mere audacity for the sprawling Idolm@ster franchise to introduce its next generation of money shakers and movers through advertising. It would be weird if they didn’t try to advertise their games. Imagine if you are watching TV and all the ads are paid content? But wait, what if the ads were better than the TV program you were watching? I mean, it sounds silly, but the scenario isn’t that far-fetched. In some ways that’s what is happening. If having the Million Stars in Moviem@s jarred you from the fantasy world you were living in, congratulations, Scamco whiffed and couldn’t bring some full-body characterization to the seven girls (Minako, Anna, Serika, Shiho, Kana, Nao, and Yuriko) and thus enable you. Good for you. But to me, I see it a courtesy. They’re telling you what’s going on, and in some ways focusing the movie away on the ML girls and on the 765Pros is what everyone wanted. It’s just there are some issues to the movie given all these arrangements, and to some degree the results may disappoint some people. If you look at Moviem@s as some kind of as-is, commercially available, hourly-fungible disposable entertainment, you’re missing the point. Moviem@s, for Producers, is IM@S’s totem that embodies the past and future of the franchise, of the idols, of our emotions all together. It’s our M@sterpiece. Of course, it’s perfectly okay to miss the point, but don’t expect any sympathy from us if you stopped yourself from having a good time. What I recommend, actually, is just watch Moviem@s a bunch of times. This stuff actually has a lot of rewatch value, and you wouldn’t even know it. PS. By the way I’m just glad Matsuri and Fuka make appearances in this thing after all, as these two are my top ML idols today. There’s a weird time-wrap effect going on when you revisit the thing that enabled you, and you have a different appreciation all together. What’s funny is that the content is even “new” because, well, it’s not some telescoping introspection for years past. It’s barely 8 months! PPS. The CG concern is real and I understand it, but it is, in the larger scope of things, trivial. This entry was posted on Thursday, October 9th, 2014 at 3:23 pm and is filed under Idolmaster, Modern Visual Culture. You can follow any responses to this entry through the RSS 2.0 feed. This is whining, but I’d like to clarify a statement in there. I didn’t care about ML at all when I watched it back in Feb. However, I wasn’t going to complain (and didn’t) if they spent some time on these new characters, as if somehow there’s some sort of justice or worth if a few more seconds on my oshi instead would make the movie better. That mentality was never what IM@S was about thematically, even if it is common among fans. If there’s anything actually problematic with the ML characters, it’s that the movie did a weak job portraying them other than Kana and Shiho. The fact is the movie has a concept. If you want to complain about that concept that’s legit in my eyes, but keeping an open mind about the ML characters is really what you should be doing. Just because you’re fixated on a specific aspect of IDOLM@STER is a terrible justification to complain about the other aspects of the IM@S story/franchise as if they shouldn’t exist. In my example, that would have prevented me from having fun following today’s IM@S with its focus on CG/ML. I still don’t play CG and don’t touch it much, but you probably won’t see me complain when invariably the anime (or more increasingly, live appearances) involve the new characters (or actresses) in more doses than some trap some old fogie is fond of and never got over with.